New Delhi: India is likely to utilize the principles of a broad-based forum such as the United Nations Framework Convention on Climate Change (UNFCCC) to sidestep the possibility of being locked into unwanted positions at an elite grouping such as the Group of Twenty (G-20) whose members meet later this week. In the runup to Prime Minister Manmohan Singh’s participation in the G-20 summit to be held in Pittsburgh, US, on 24-25 September, the government has said UNFCCC —which 192 countries subscribe to—should be the main forum for negotiations on climate change. In the first week of September, finance minister Pranab Mukherjee attended a G-20 summit in London, which was meant to prepare the ground for the Pittsburgh talks. A solution to financing ways to combat climate change was introduced on the agenda, which India found discomfiting. G-20 is an informal forum to discuss key issues of global economic stability, with its members accounting for 90% of global gross national product, 80% of world trade and about two-thirds of the world’s population. It includes the Group of Seven industrialized countries—the UK, Canada, France, Germany, Italy, Japan and the US—and major developing countries—Argentina, Australia, Brazil, China, India, Indonesia, Mexico, Russia, South Africa, Saudi Arabia, South Korea and Turkey—as well as the European Union. At the London meeting, India said it wanted a solution that was in sync with the underlying philosophy of UNFCCC, according to a government official present in London. Another official, familiar with India’s game plan for G-20 issues, said brandishing UNFCCC commitments at the so-called high table was a strategic move to neutralize a chance of talks on financing climate change moving in a direction unsuitable to India. “We will work the international system to our advantage," the official said, explaining it was common in negotiations. Both the bureaucrats spoke on condition of anonymity. 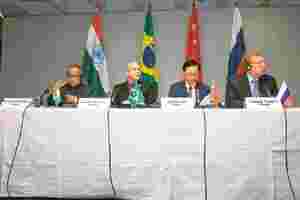 In London, the finance ministers of Brazil, Russia, India and China (Bric) said UNFCCC, which oversees the drafting of a new treaty, should be the main forum for negotiations on climate change, the Reuters news agency reported on 5 September. A key reason underpinning India’s strategy is the principles of UNFCCC, which work in India’s favour when it comes to solutions for climate change financing. UNFCCC exempts developing countries from being forced into commitments on measures to mitigate climate change. Before the London meeting, the first official had told Mint that India’s invitation to be a part of G-20 negotiations meant a seat at the “high table". However, a seat there meant the invitees were expected to engage each other in a way which led to solutions, unlike a more democratic forum such as the United Nations, the official added. Rajiv Kumar, director and chief executive, Indian Council for Research on International Economic Relations, had earlier said: “Real action is taking place outside the formal governance structure. Earlier it would be G-8 (Group of Eight), now it is the G-20." After his return from London, Mukherjee used two different platforms to announce that India faced pressure on climate change financing from developed countries at G-20. “Financing of climate change was an area where there were divergence of views. They (the developed countries) want it to be within the purview of finance ministries and treasury departments of different countries," Hindustan Times on 7 September quoted Mukherjee as saying while he was speaking at the forum of financial writers. Subsequently, Mukherjee expressed similar views in another engagement with journalists. According to the two officials familiar with India’s G-20 strategy, Mukherjee was playing his part in a move aimed at offsetting pressure on India. “We don’t want decisions in G-20 and MEF (major economies forum) which will abridge options’ possibility in UNFCCC," said Prodipto Ghosh, a former secretary in the environment ministry who is presently associated with The Energy and Resources Institute (Teri). At the MEF meet on energy and climate on 9 July in L’Aquila, Italy, India committed itself to joining other countries to act quickly to limit global temperature increase at 2 degrees Celsius above pre-industrial levels. The MEF agreement raised questions about whether India had implicitly abandoned its stiff opposition to binding emission targets that could harm economic growth and poverty alleviation. “A cardinal principle (in UNFCCC) is of common but differentiated responsibilities," Ghosh, who studied chemical engineering at the Indian Institute of Technology, Delhi, said. Differentiated responsibilities has been a key element of India’s stand on climate change negotiations. Differentiated responsibilities are accepted at UNFCCC because of the varying historical contribution of different countries to carbon emissions. According to Arvind Panagariya, economics professor at Columbia University in the US, developed countries accounted for more than 70% of the emissions between 1850 and 2000. India’s share was 2%. The US has aggressively pursued a solution to financing climate change in the G-20 forum. Among the ideas the US is willing to consider are ones, which might not be in sync with UNFCCC principles, said the first official quoted in this story. The US expected a forum such as G-20 to come up with solutions which would serve as a template for a broad-based platform such as UNFCCC. Commitments made at UNFCCC are legally binding on the signatories. Even as India-US relations in multiple areas have expanded in the last few years, the new US administration under President Barack Obama has clearly said the way India cooperated in global challenges would be the real measure of the relationship. A day after he presented his credentials to President Pratibha Patil in August, Timothy Roemer, the new US ambassador to India, said: “The real test of our partnership will be how we work together on the important common global challenges of our era."